New Zealand held firm to claim their first series win over England in 19 years as the second Test ended in a draw on the final day. England were desperate to end their gruelling trans-Tasman tour on a winning note, having suffered a humiliating 4-0 loss to Australia in the Ashes, while Joe Root’s men were humbled by an innings and 49 runs against New Zealand in the opening Test. And England looked on track to salvage something from their travels and level the series as Stuart Broad (2-72) claimed wickets from the first two balls in Christchurch on Tuesday. But the Black Caps dug deep, not interested in chasing down the 382 needed for victory, frustrating England to beat the tourists in a series for the first time since 1999. 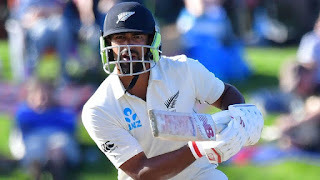 Ish Sodhi produced a defensive masterclass, scoring 56 off 168 balls as New Zealand – who reached 256-8 – claimed a series win over England on home soil for the first time since 1983-84. England huffed and puffed, and they managed to get within two wickets of victory with as many as eight fielders surrounding the batsman, but they ran out of time and light after dismissing Neil Wagner (7 from 103) as the tourists were left searching for their first away victory since their trip to Bangladesh in October 2016. Root’s pursuit of victory was held up by bad light on Monday but the visitors wasted no time on Tuesday as Broad rattled the Kiwis with successive wickets to open proceedings. New Zealand had resumed on 42-0 with Jeet Raval (17) and Tom Latham unbeaten but the former clipped Broad to square-leg and then captain Kane Williamson edged a rising delivery behind. Ross Taylor (13) managed to deny Broad a third Test hat-trick in a stunning start to the morning but he soon departed as Jack Leach (2-61) celebrated his first Test wicket – the New Zealand batsman top edging a sweep to short fine-leg. James Anderson (1-37) joined in the action, this time floating a delivery outside off-stump to Henry Nicholls (13), who nicked through to slip, with the Kiwis rocking at 91-4. Opener Latham and BJ Watling (19) saw New Zealand through to lunch but their hard work came undone shortly after the break – the latter dismissed cheaply by Mark Wood (2-45) as Anderson took a simple catch at leg slip. With thick clouds looming, England were in a race against the setting sun and they boosted their hopes of victory by claiming the prized scalp of Latham for a gutsy 83 – Leach the bowler as James Vince took a fine catch running in. Mark Stoneman put down a tough chance at silly point before Sodhi had scored, and the batsman took full advantage of that reprieve as he and Colin de Grandhomme ate up almost 26 overs in a stand of 57. De Grandhomme, who troubled England with the ball as he took four wickets on Monday, fell five runs shy of an impressive half-century when he fell victim to Wood’s bouncer not long after tea. It was left to Sodhi and Wagner to hold down ot, the umpires immediately called an end to play amid the fading light.